Map of the Southern Highlands - Towns, roads, places to visit and go, and National and State Parks. 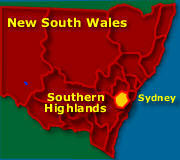 See more Southern Highlands NSW Information. 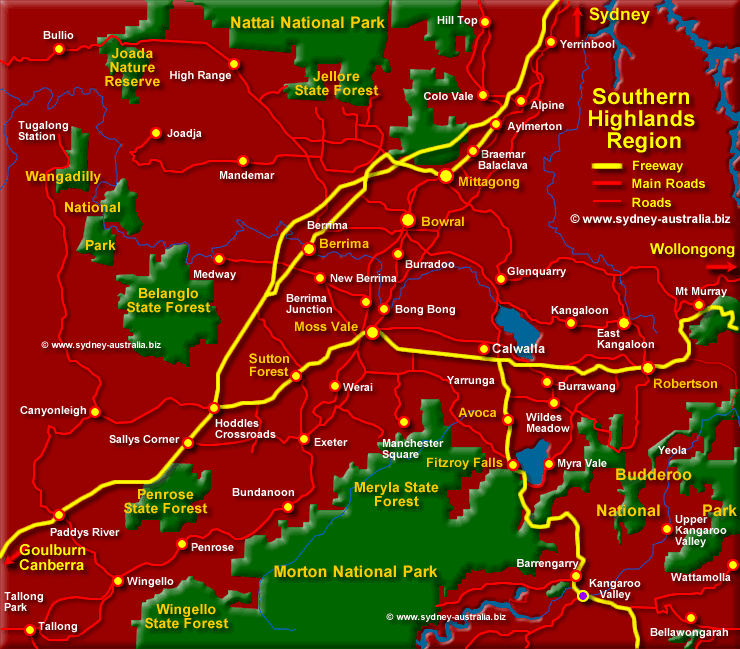 This map shows Kangaroo Valley, Morton, Budderoo, Wangadilly and Nattai National Parks, and surrounding towns and villages including Mittagong, Bowral, Berrima, Moss Vale and Sutton Forest. Also roads, state parks, lakes and reserves. Kangaroo Valley is a must see for the region. This valley is being preserved for its natural surrounds, wildlife and historical significance. See Kangaroo Valley on the lower right on the map. More about Kangaroo Valley NSW. Wollongong, to the east is the third largest city in New South Wales on the coast, with lots of beaches and things to do, and places to visit. You can head from the Southern Highlands to the beautiful Sapphire Coast with its stunning beaches and National Parks in a few hours Touring the South Coast NSW. Proceed south from Campbelltown in Sydney on the South Western Freeway - Just over an hours drive 1 hours drive from Sydney. Canberra, to the south east in the Australian Capital Territory and the South Coast of NSW to the east, are only a few hours drive away. Sydney is approximately 3 hours drive north. Map of Greater Sydney Surrounds showing Sydney Eastern beaches to the Blue Mountains, the airport, Sydney Northern Suburbs to the Sydney Southern Beaches, Campbelltown and Picton.